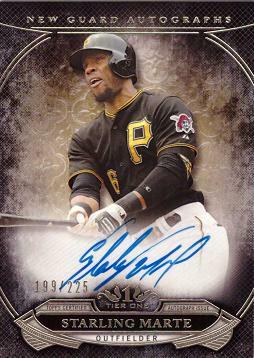 From the 2015 Topps Tier One Autograph series, this is an authentic autographed baseball card of Pittsburgh Pirates outfielder Starling Marte. Certificate of Authenticity is on the front of the card. This card is serial numbered 225, meaning only 225 of these cards were procuded. Card will be shipped in a new protective holder to ensure a safe delivery. 2015 Topps Tier One New Guard Autographs #NGA-SMA - Only 225 made!